This jacket is a result of the color block frenzy that I'm currently on. But - as I do - this jacket was cut out last fall. (A year ago last fall) If you look at the Zebra post - you can see the pieces hanging in the background. (smile). Well, I got sick of picking them up off of the floor and said - "I need to finish the purple jacket!" So I did. But, it sat on the dress dummy even longer because I didn't like the buttons I purchased and just didn't know what I wanted. My friend Grace said "Use the purple fabric and cover a button." DUH!! Sometimes you just need someone else to enlighten you. So, I did and I really like it. 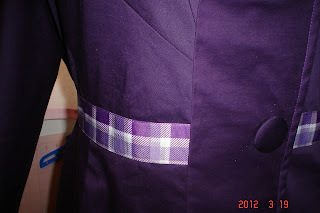 The plaid trim is a result of (shhh) a deco machine stitch gone wrong that I just didn't want to pick it out! Came out nice! This jacket was straight forward on instructions. This is a pattern for the intermediate+ sewer. 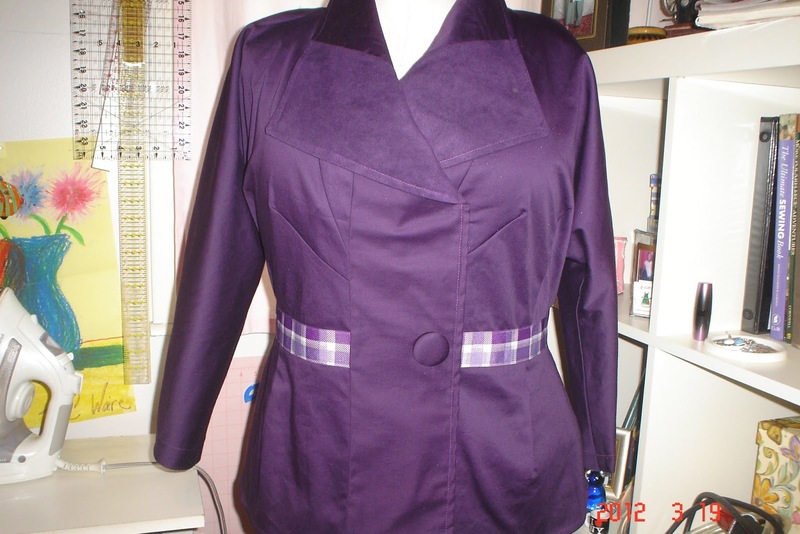 There are lots of pieces and the jacket is fully lined. 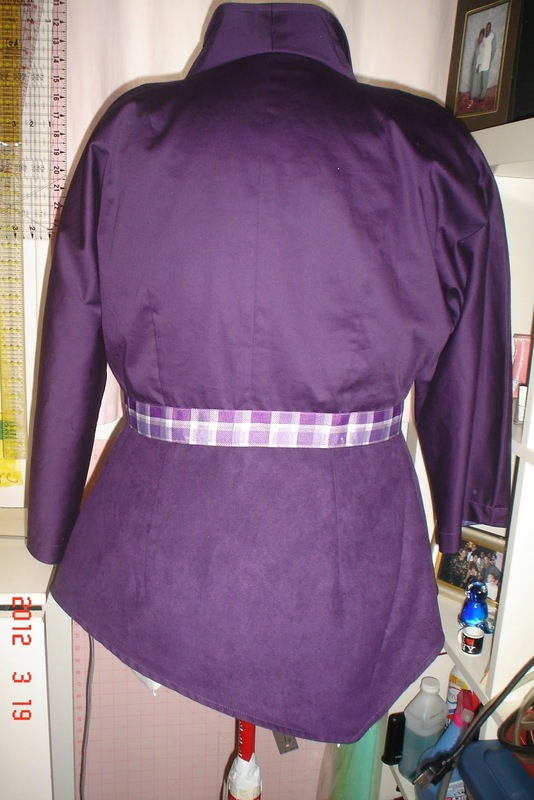 The back of the jacket is asymmetrical which is quite a nice style element. 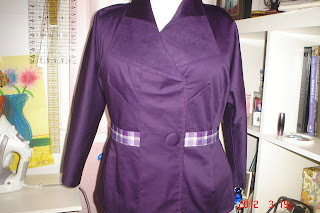 I mixed fabrics on this jacket. 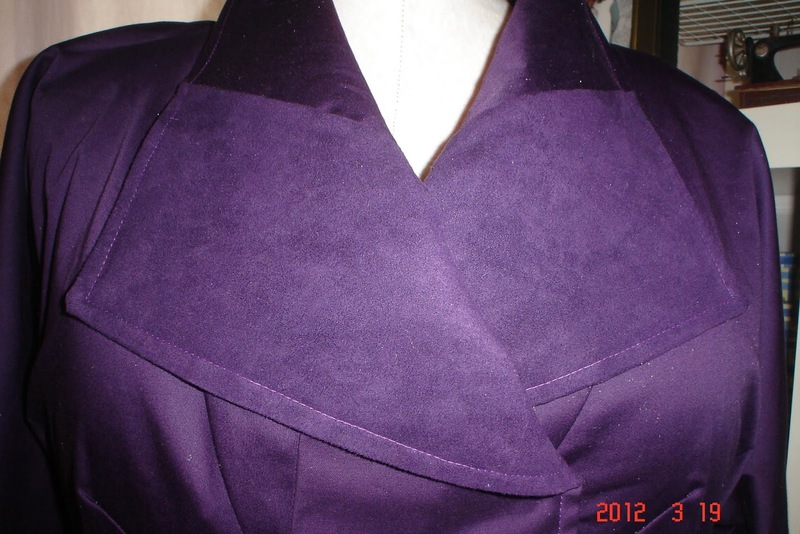 I used Purple Faux Suede on the facings and bottom back and Cotton Sateen for the rest of the jacket. The lining was purchased on a trip to New York City about 8 years ago. (whew!) 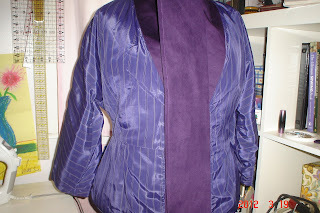 I added a muslin jacket stay to the back, jacket interfaced the the front and facings. The color is all that! I want to make some lime green cigarette pants to wear with it. (Owwww!). Inside out. Lining from NYC. Very Slippery! ﻿I do recommend this pattern for it's sleek unique look but, I won't be making another. Maybe I'll go sew the buttonhole!